Note: Tonight’s update will be my last update for Week Eight. I will be out of town and only sporadically in contact with the Internet for the next four days. I will return on Monday to take a look at how Week Nine is going. As always, check Big Sur Kate for the latest fire information. This is probably a good move that will provide greater security for homes on Chews Ridge and beyond in the event that drier weather gets the fire moving again, but there is no denying that it is also a bold move. The practice on this fire, until now, has been to wait to conduct firing operations until an active fire front is nearly to the line – and even that has generated criticism (unfounded, in my opinion) that the Forest Service is artificially moving the fire forward. In this case, the fire perimeter is still quite far from the line and, thanks to successful firefighting efforts and cooperative weather, this portion of the perimeter has not noticeably advanced since sometime around August 24. This obviously raises the stakes for the Forest Service since, if this firing operation gets away from them and causes damage, it will be difficult to convince the locals that it was necessary. I’m sure they wouldn’t be doing it if they weren’t confident that the terrain and weather are on their side – but it’s still a bold move. In any event, the firing began too late to be picked up by the satellites which, once again, found no heat over the fire. This evening’s official numbers: 107,375 acres; 52% contained; 57 homes and 11 outbuildings destroyed; 1 fatality; 7 injuries. 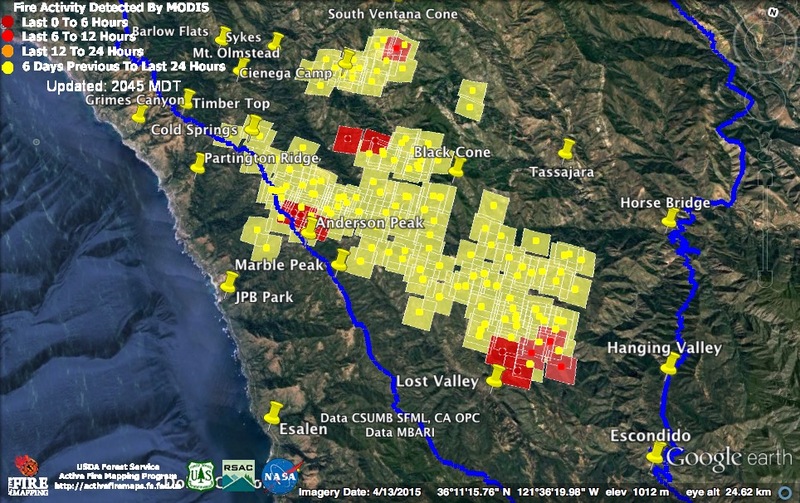 Click here to view Monterey County’s Soberanes Post-Fire and Recovery Information page. It contains the newly released BAER report and associated maps for the northern portion of the fire. A heavy marine layer continued to suppress active burning overnight and the satellites once again found no new heat. There is no infrared map this morning either. It was probably too foggy and cloudy to allow an infrared scan to proceed. The new team that took over command of the incident yesterday apparently decided to take a fresh look at the containment figure, which has remained at 60% for over a month (since August 12). As a result, they have reduced containment to 52%. They now place the size of the fire at 107,097 acres. The prevailing northwest wind is expected to return and the weather is expected to get warmer and drier again as we head into the weekend. There were gusty south winds today, but there was also a 3,000 foot deep marine layer and the higher humidity suppressed active burning enough that satellite passes around 11:00 am and 3:00 pm found no new heat on the fire. This evening’s official numbers: 107,050 acres; 60% contained; 57 homes and 11 outbuildings destroyed; 1 fatality; 7 injuries. A satellite pass at around 11:30 last night found heat only at the southeastern end of yesterday’s run along the Coast Ridge. Big Sur Kate reports that someone with a view of the area saw no sign of fire on the wrong side of the line yesterday and the Forest Service reports this morning that “all indirect lines held throughout the night.” While it is likely that any spotting over the line has been minor and easily controlled, there is no question that the fire has far outrun the firing operations and is now burning directly below unfired line. This is confirmed by this morning’s Operations Map, which includes some limited IR data. The IR data was added around 4:00 am this morning, but it’s not clear when it was acquired. The IR scan seems to have covered only the two areas of greatest concern; the Coast Ridge and the Arroyo Seco River. The IR mapping shows a long run along and to the east of the Coast Ridge line with intense heat at it’s head (in approximately the same location as the MODIS heat detection on the map above). There is also some scattered heat along the bank of the Arroyo Seco River, but no sign of the fire having gotten across. Yesterday’s run from the North Fork to the top of the ridge above Tassajara Creek has also been drawn in on the map, but there is no sign of this new perimeter being based on actual IR data. The driver of a water tender that went off the North Coast Ridge Road and rolled multiple times before coming to rest approximately 300 feet down the mountainside Sunday morning is reported to be in stable condition at Natividad Medical Center in Salinas. We wish him a speedy recovery. The Forest Service says the fire is now 107,050 acres. It may have been cooler today, but lower humidity and breezy conditions created an active fire day anyway. 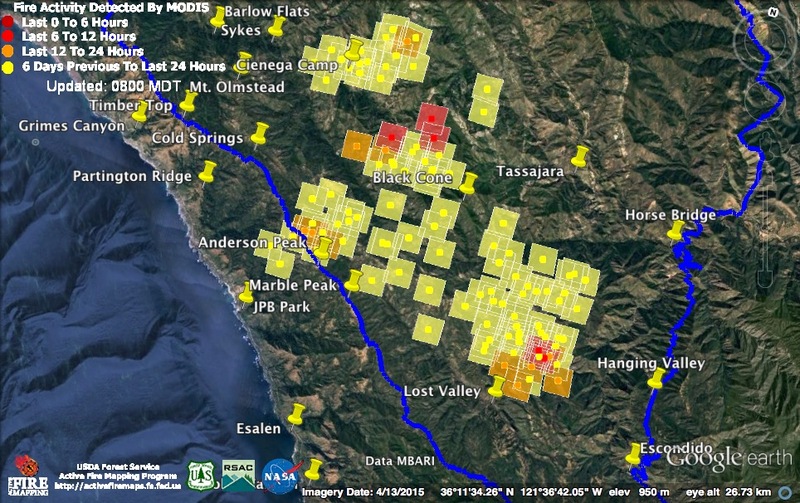 There was no new heat detected at the leading edge of the fire, near the Arroyo Seco River, but the fire along the North Fork Big Sur River burned west to the edge of the fresh black along Cienega Creek and made another big run to the ridge overlooking Tassajara Creek. The firing operations on the Coast Ridge also resulted in a large-scale burn today. The red heat detections were acquired around noon and 2:00 pm this afternoon. Yes. There are a lot of heat detections on the wrong side of the Coast Ridge fire line. This could be an error – or it could be that there was some spotting over the line today. There has been no word from the Forest Service, but more planes, including the DC-10 VLAT were called to the fire in the middle of the day today. 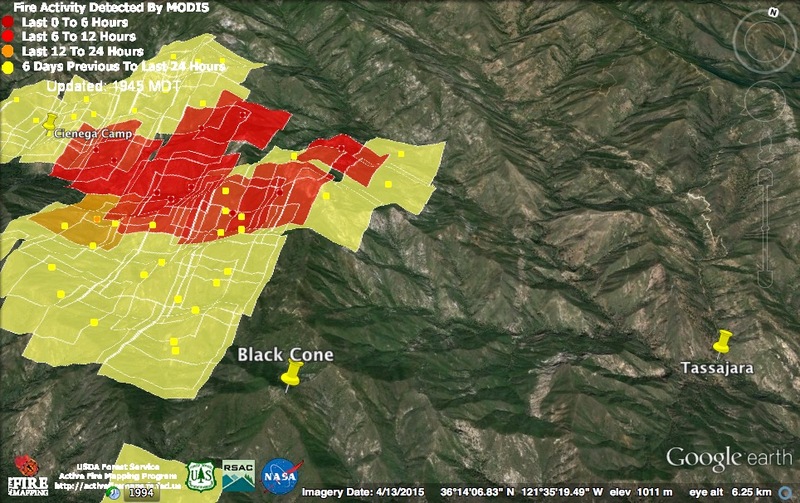 The southernmost heat detections are on the ridge between Hot Springs Canyon and Big Creek. It is possible that the fire from yesterday’s firing operations, which had descended into Indian Valley last night, could have reversed course and run back at the Coast Ridge. 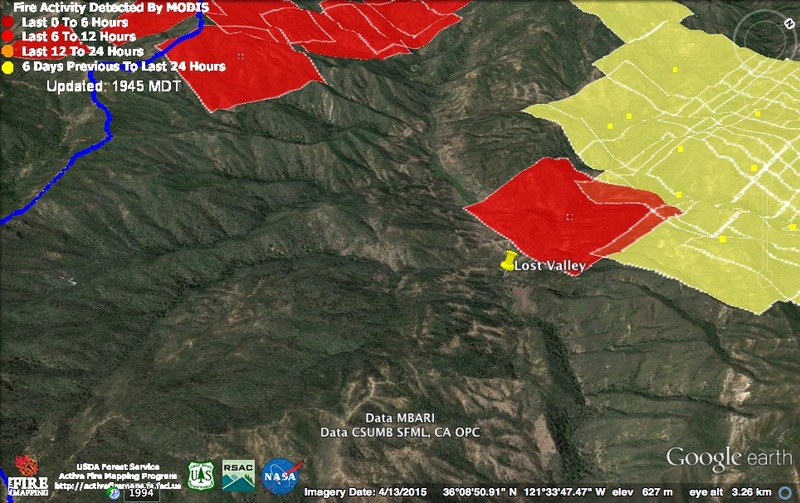 That happened just to the east, where the fire along Lost Valley Creek reversed course and, instead of burning further toward the Arroyo Seco River, burned upstream to somewhere around the confluence of Lost Valley and Higgins Creeks. The large fire front created by the Coast Ridge firing operations can be seen stretching across the upper Higgins Creek watershed. The fire near Lost Valley Camp is now in position to make an uphill run at the Coast Ridge containment line. Meanwhile, to the north, it appears likely that fire has, once again, spotted over into the upper Tassajara Creek watershed. This could also be the reason why additional planes were ordered today. 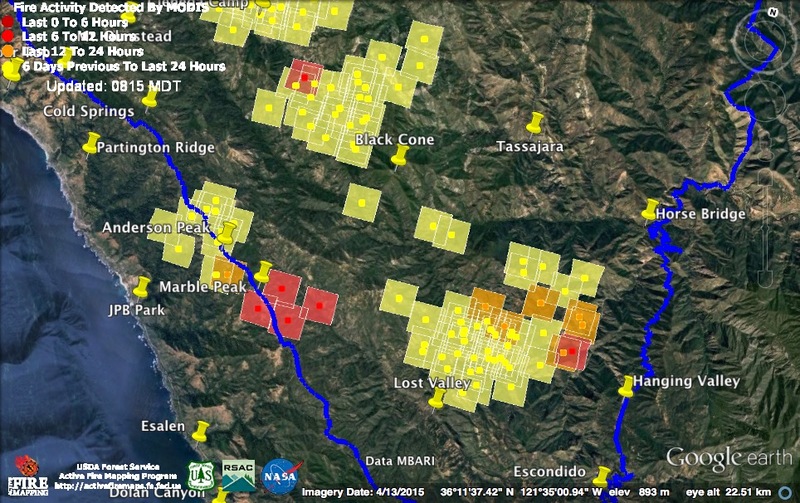 Satellite passes at around 10:30 pm and 3:00 am found fire moving downstream along the North Fork Big Sur River, backing toward the Arroyo Seco River and spreading east from firing operations on the Coast Ridge. On the Coast Ridge, firing operations have now moved on past Marble Peak. 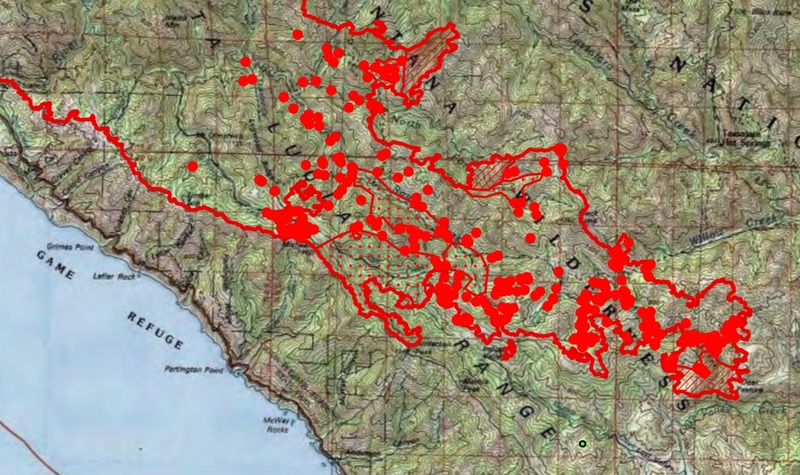 As shown on this map and confirmed by the Forest Service, flames from those operations spread east last night into Indian Valley, at the headwaters of Higgins Creek. Fire has been smoldering in Indian Valley (and presenting a threat to the Coast Ridge containment line) for many days now. This burn out will, hopefully, neutralize that threat. This morning’s infrared map, based on data acquired earlier in the evening, does not show this spread. The leading edge of the fire, meanwhile, is still backing toward the Arroyo Seco River, just downstream of the Lost Valley Creek confluence. Should the fire get across the river, the eastern containment line could quickly be challenged by strong uphill runs. 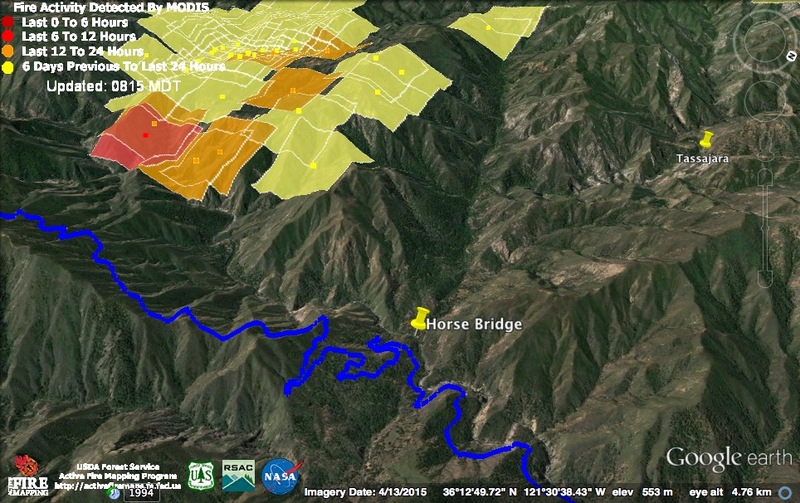 This view, centered on Horse Bridge, at the Arroyo Seco River/Tassajara Creek confluence, shows more clearly the position of this portion of the fire relative to the Tassajara Zen Center. Willow Creek flows through the prominent canyon that drains into Tassajara Creek just above Horse Bridge. 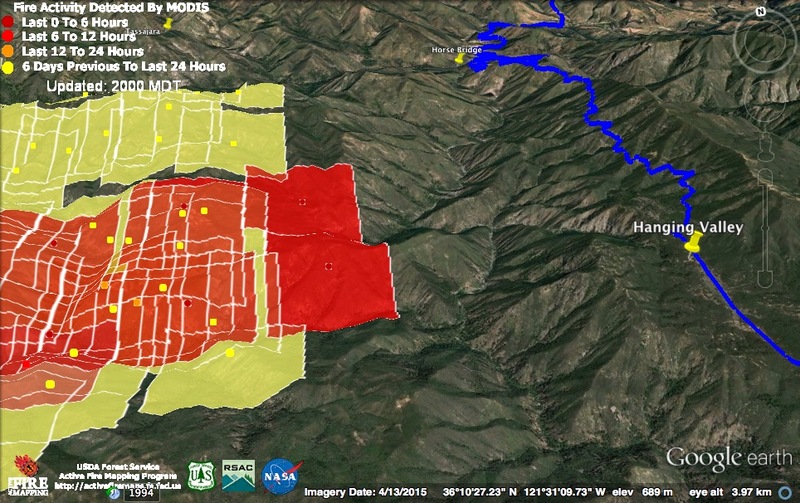 The Forest Service is concerned that the fire smoldering and burning on the ridge south of Willow Creek (under the yellow squares) will spread down toward Willow and Tassajara Creeks, then run up canyon toward the Tassajara Zen Center. The weather today is expected to be colder and drier than yesterday. Cooler weather is good, but relative humidity may, unfortunately, sink into the single digits on some parts of the fire. It may also be breezier than yesterday on the ridge tops, so further spread is a distinct possibility. This morning’s official numbers: 105,705 acres; 60% contained; 57 homes destroyed; 11 outbuildings destroyed; 1 fatality; 6 injuries. Other than the firing operation on the Coast Ridge, the action today was all on the fire’s eastern edge. There doesn’t appear to have been any additional movement toward Willow or Tassajara Creeks. Instead, the fire moved down toward, but probably not yet across, the Arroyo Seco River downstream of the Lost Valley Creek confluence. Light red heat detections were acquired around 11:30 am; dark red around 3:00 pm. A satellite pass around 11:30 pm last night found fire running along the top of the ridge between Willow Creek and the Arroyo Seco River. The Forest Service is concerned that this fire could back into Willow Creek and get into the mouth of Tassajara Creek (Willow Creek flows into Tassajara Creek just upstream from Horse Bridge, on the Arroyo Seco River). From there, it could burn upstream toward the Tassajara Zen Center. This, together with concerns about fire spotting into the Tassajara drainage (see below), appears to be the reason for the evacuation order issued for the Tassajara Road south of Chews Ridge last night. The fire could also continue down the ridge top toward Horse Bridge. If it gets across the Arroyo Seco River, it could run uphill at the containment lines along the Arroyo Seco – Indians Road. This is undoubtedly the reason for the evacuation warning issued for the Arroyo Seco area last evening. As of this morning, the Forest Service reports the fire above Willow Creek is doing neither of these feared things, but is instead holding in place and cooling down. 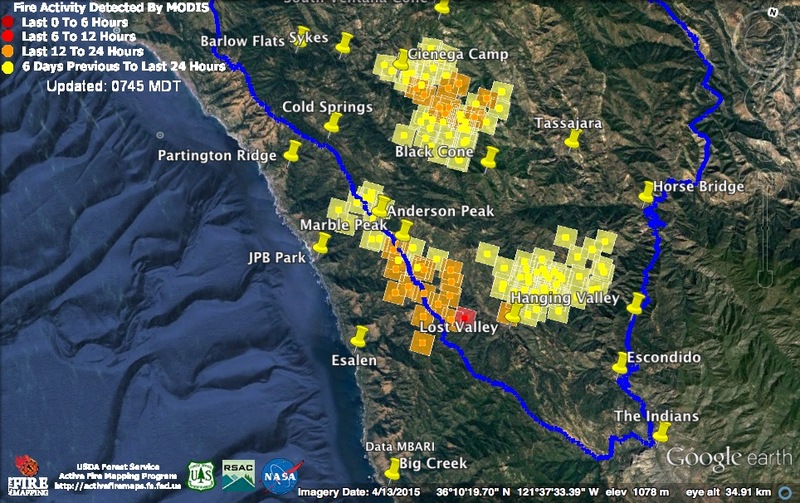 To the north, the satellite found no sign of yesterday’s big run out of the North Fork Big Sur River getting fire established in the Tassajara watershed. 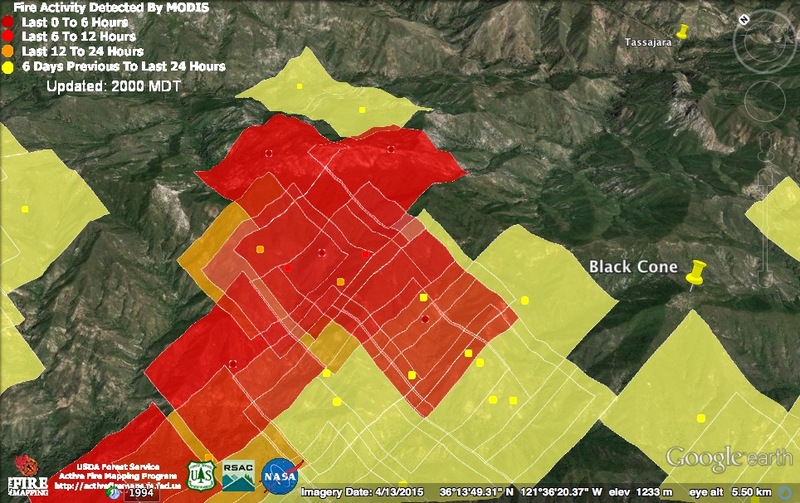 The only heat detection in that area is deep in the North Fork canyon. The Forest Service agrees that yesterday’s run has cooled down, but warns that it “may have spotted over the ridge.” They will undoubtedly be working to douse any hotspots that appear there today. Humidity is still increasing over the fire, but today may be a bit breezier than yesterday, as the prevailing northwest winds are expected to return. This morning’s official numbers: 105,642 acres; 60% contained; 57 homes destroyed; 11 outbuildings destroyed; 1 fatality; 6 injuries. Firing operations continued southeast along the Coast Ridge between Anderson Peak and Marble Peak today. Meanwhile, the main fire remained very active along the North Fork Big Sur River and along Lost Valley Creek. Light red heat detections were acquired around 12:30 pm; dark red around 2:00 pm. The fire made another big run out of the North Fork Big Sur River and up to the ridge overlooking Tassajara Creek today. There was a report a little over an hour after these heat detections were acquired that Incident Command was requesting 3 additional air tankers (for a total of 7) due to the fire making a “heavy” run and spotting up to a quarter mile ahead. 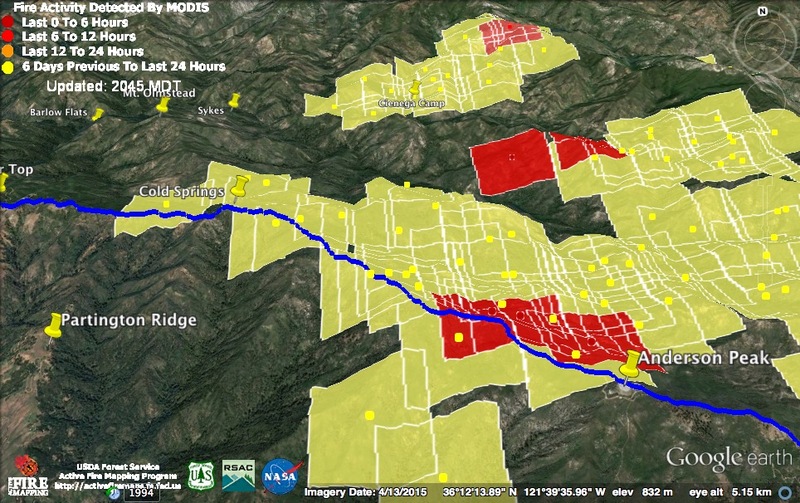 Whether or not they succeeded (once again) in preventing fire from establishing itself in the Tassajara drainage we probably won’t know until tomorrow. The fire along Lost Valley Creek changed direction today and, instead of burning further upstream toward Lost Valley, burned downstream, apparently on both sides of the creek, toward the Arroyo Seco River. If the fire crosses the Arroyo Seco it will have an uphill run toward Hanging Valley and the fire line along the Arroyo Seco – Indians Road. There are contingency lines along the top of the ridge to the right of the road. This evening’s official numbers: 103,847 acres; 60% contained; 57 homes destroyed; 11 outbuildings destroyed; 1 fatality; 6 injuries. The fire was most active overnight along the North Fork of the Big Sur River, where it made yet another run toward the ridge overlooking Tassajara Creek. This morning’s infrared map, based on data acquired around 11:00 pm last night, shows this run getting underway. The red heat detections are from around 11:00 pm and 3:00 am. 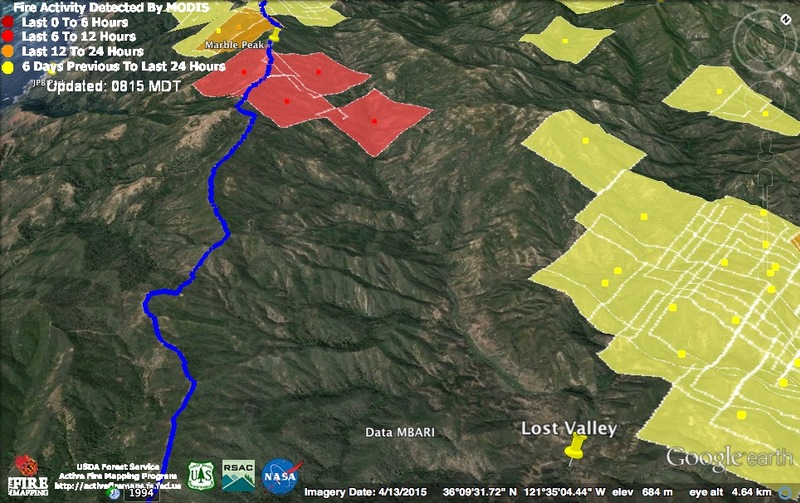 The infrared map also confirms that fire has crossed Lost Valley Creek near the Zig Zag Creek confluence. There should be moist air and very little wind over the fire today, which is good. But there will also be atmospheric instability, which could lead to cumulus build-up and even, possibly, a thunderstorm or two – which could create dangerous, fire-spreading downdrafts. There have been questions in the comments here, and elsewhere, about why the Forest Service is “letting” the fire burn so far and why it isn’t doing more to stop it. The answer is that the fire is burning in terrain where it is too dangerous to fight it directly. Instead, firefighters build indirect lines (in blue on the map) and backfire from those lines as the fire gets close. Meanwhile, they use planes and helicopters to slow or stop the spread of the fire within the lines. Thanks to cooperative weather, this effort has been quite successful. The fire in the Carmel River watershed has been held completely in check for some weeks now and fire has, so far, been prevented from establishing itself in the Tassajara Creek watershed. If the weather continues to cooperate, bucket drops and retardant lines may be able to hold much of the fire in place until rain puts it out. This morning’s infrared map puts the size of the fire at 103,847 acres. There appear to have been three satellite passes today; around noon (light red squares), 1:00 pm and 3:00 pm (dark red squares). Rather than making another run toward Tassajara Creek, the fire along the North Fork of the Big Sur River ran in the other direction today, back into the South Fork canyon. The noon satellite pass found some heat still lingering on the top of the ridge from yesterday’s run out of Cienega Creek, but none later. The 3:00 pm satellite found renewed heat in the area of the firing operations along the Coast Ridge. Just as the Forest Service had warned, up canyon wind began moving the south end of the fire southwest up Lost Valley Creek. The positioning of the heat detections strongly suggests that the fire may have crossed Lost Valley Creek in one or more places. 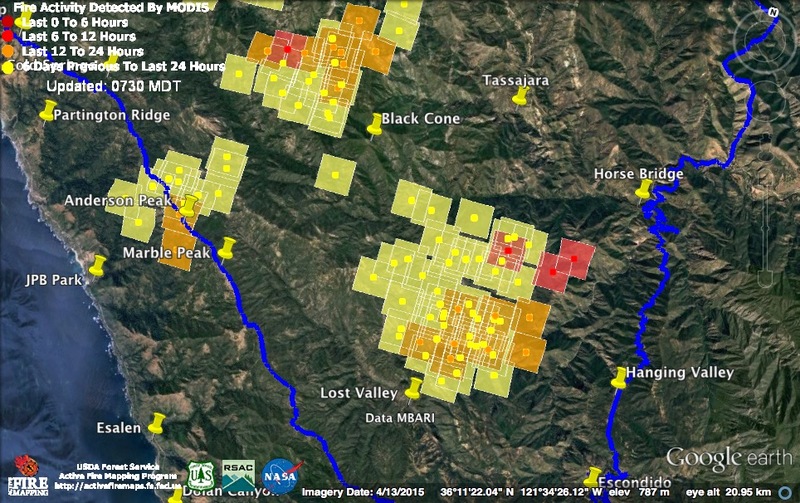 There was, once again, no fire active enough to be noticed by the satellites in the Willow Creek watershed or around Black Cone (the portions of the fire perimeter closest to the Tassajara Zen Center). This evening’s official numbers: 103,242 acres; 60% contained; 57 homes destroyed; 11 outbuildings destroyed; 1 fatality; 6 injuries. Here’s the section of this morning’s infrared map depicting the business end of the fire. This map was based on data acquired a little before 9:00 pm last night. The fire apparently gave in to increasing humidity and laid down some later in the evening, as the overnight satellites found no heat. The infrared scan did not find a spot fire on Tassajara Creek, so that was either an error or it was knocked down during the afternoon yesterday. The map does show fire from the run out of Cienega Creek spilling over into the Tassajara drainage and does show active fire along the North Fork Big Sur River. 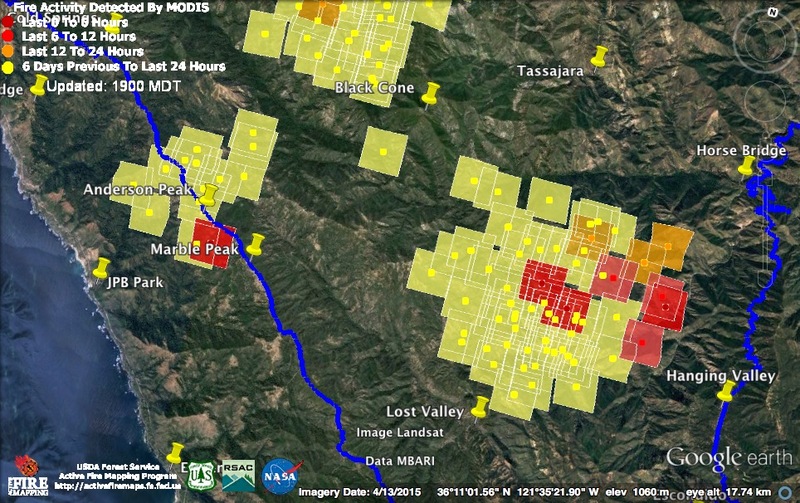 There are isolated heat detections in the Willow Creek drainage and overlooking Tassajara Creek north of Black Cone. At the southern end of the fire, the infrared scan shows active fire close to, but not across, Lost Valley Creek. The Forest Service predicts that up canyon winds may push this fire southwest toward Higgins Creek and Lost Valley today. According to the infrared map, the fire is now 103,242 acres. This entry was posted on Friday, September 9th, 2016 at 7:40 am and is filed under Big Sur, Fire, Flood & Apocalypse, Santa Lucias. You can follow any responses to this entry through the RSS 2.0 feed. You can leave a response, or trackback from your own site. EIGHT WEEKS?!? Unbelievable. Thanks once again, Keith. Here’s hoping the low pressure fog we’ve been getting for the past couple of weeks finally puts this thing out for good. I’ve seen increasing suggestions that this fire has more to do with publicity, funding, and spending, than an actual wild fire threat. The whole thing could have been completely tamped down within the initial first week, end of July 2016, time frame. I’m feeling really jaded right now. Did it burn many redwoods in the area? Katie, your comment is a total slap in the face of all of the people who have fought this fire, including the dozer operator who lost his life on the line and the people who lost their homes…..but you hold on to that “jaded feeling” over there in PG….. Thank you for all your updates on this site….the information is invaluable! Kelly – Yes, there have been many unfortunate incidences. Please do not assume more than I state here in the comments. There was, for the record, an immense effort made to stop the fire during its first week. This effort involved more than 5,000 firefighters, supported by more than 60 bulldozers and numerous planes and helicopters – including a DC-10 VLAT. Unfortunately, the wind-driven fire was spotting ahead of itself and easily jumped even very wide dozer and retardant lines. Some people have great difficulty accepting that there are forces of nature over which we have little to no control. Well put. Perhaps Katie has not spent any time in this area to understand the amount of built-up fuel and extremely dry conditions, and does not recall the high pressure system and high temps when this got rolling in late July. Even if she is just repeating ‘increasing suggestions’, it’s Monday morning quarterbacking with no appreciation for the complexity of the situation. rather dramatically illustrates how far ahead of the main fire front the spotting occurred and how fast the spot fires grew. With every fire in the last decade or so, I have noticed that some people feel a need to make someone or some entity “responsible” for the force(s) of nature. Does anyone here remember the 1943 fire on Long Ridge? kind of a random thought – but thinking about that crater that once was big pines and i then saw this – https://www.pacificforest.org/newsletter-restoring-flourishing-forests/ – don’t know if that’s posted as a live link – but the idea of re-seeding forests is something i think about a lot. not sure if that could even apply to terrain like ventana. but even in the short 25 years i’ve been exploring there i’ve seen massive degradation – between the two outdated dams, fires, the over use / trashing of site like sykes and the general encroachment of development into the wild lands – and then factoring in drought – its like a perfect storm. of course – not sure how realistic of an idea that is. Definitely a lot more engines on the road out to Tassajara tonight, lots of earlier helicopter activity. Lewruli: I’ve thought a lot about Big Pines as well. As an old treeplanter and forestry consultant, I can say—assuming it would even be an allowable wilderness activity—it would be a marginal proposition at best. When a pine forest isn’t producing a lot of natural regrowth, as Big Pines was not the last time I went up there after the Basin Fire, it’s telling you what you need to know about possible viability. Not to mention the undoubtedly highly localized genetic variations of the forest up there are not anything to be tampered with lightly. The Santa Lucias are just not great planting country. But who knows, with a wet spring and a few shady, brush denuded spots, there might be a chance at decent natural regeneration until drought and madrone encroachment take their toll. It needs to burn up there to keep the pines, but two big, hot fires in under ten years is not exactly a hopeful development. I think a lot about the ludicrous damage done to ridge line sugar pines down around Twin Peak/Cone Peak and probably other areas in the Basin Fire. Uneducated tree fallers wiped out some important seed trees in no danger of adding to a conflagration. I’m sure there will be some more horror shows out there after this fire. Funny, in my last post on my “Earth’s Internet” blog, I was just hitting on all these points with regards to this movement of reintroducing Grizzly Bears back into California. Not only do many of the seed banks now comes from areas of California with genetic programming adapted to foreign environments, the Grizzlies also will not have the extinct California Grizzly traits necessary for survival here. In the old days in SoCal (San Diego & Riverside Co) I use to plant woodlands from trees aquired from L.A. Moran which now is gne. All planting project initiatives receive trees from out of state nurseries from what I last heard. I have not lived over there for 10 years but revisit periodically from Sweden. Palo Colorado Canyon was one of my favourite places for chaparral seed collection because they have so many possitive traits for landscape specimens. Now it’s all toast. But here is the Grizzly post with my same points. Nice to see the thread on reintroducing Grizzlies and maybe the wolves could be returned too. I formerly lived in Big Sur and marveled at the many beautiful plant and animal species in the canyons. Certain seeds need to go through the gut of an animal before they will germinate. May the greening be gentle and diverse. About the clean up and rewinding after the fire I am wondering if there are folks speaking about this? And what of the many animals and wildlife that have been burnt out? Has there been any research or first hand experience with this? Prayers all around for all kingdoms to be out of harm’s way and free from suffering. yeah – when nature’s been tampered with so heavily it’s not easy to reverse the course, and often times attempts to do so make things worse. i think i read here or elsewhere about the seeding of non native grass after one of the major big sur fires in the 70’s and what a mess that ultimately created. as for big pines – wouldn’t it be possible to re-seed with the pines native from the area – it’s not like they’re all dead – just in that one spot? but yes – the barren nature of that one stretch doesn’t look promising for the future. who knows – maybe madrones taking over is nature’s way after all? as for reintroducing grizzlies – that’s intriguing idea, but obviously even more complicated. however, it does appear that wolves are making a slight comeback – but a very precarious one for sure. In my opinion, I feel this fire is a prescribed burn at this point, I can see the progress of it perfectly from my house. Maybe the public should be told that. As for grizzlies being introduced back into the wild, bad idea. What about hikers and horseback riders ect, being attacked? Yes climate change will impact on every little thing on Mother Earth while the plants and animals hold the keys to bringing back the biodiversity, which is slipping away. Fire was used extensively by the Native Americans in California and elsewhere to maintain the balance in ecosystems with their impeccable holistic land management. Some species of trees need a fire to spark the germination of seeds and pines may be one of those. The wolves in Yellowstone and their reintroduction in 1995 brought that landscape back to life as keystone species increasing the biodiversity of the biota and grizzlies would do the same I would think. And there are ways to work with nature and the forces which lay behind nature that are life affirming too. They hold the foundation for new life to emerge from the formless etheric realm bringing it into form. I pray that there are people working in Big Sur on that front as there comes a point where the tipping points of exploitation move into ecological collapse as if the very spirits have retreated. May the spirits in Nature be considered and loved back into being for new life to return to all landscapes. We ignore them at our peril. Wild animals such as grizzlies and wolves do not attack people without cause. I would take a grizzly or wolf any day to walking in the streets of any huge city in America. Yes they are predators and so are human beings predators. In fact we may be the most dysfunctional predator of all and the one species that has caused the Sixth Mass Extinction of all species, including our own. The wild animals are not a problem if you do not go into fear or suddenly spring upon them at a kill site or a mama grizzly with her cubs. We need an understanding of their very rhythms that have allowed them to survive that we might approach our own in a similar fashion. Rick Halsey, of the California Chaparral Institute in Escondido (San Diego), has a great page that discusses the re-seeding of Cuyamaca Rancho State Park after the 2007 Cedar Fire. It’s not pretty. I see a real botched “restoration”. It helps to hire the right people for the job and to implement the rights of Mother Earth as is happening in Bolivia and also in some of the South American tribes who observe a sacred geography. I agree the approach is the most important aspect of renewal and restoration. And people involved that understand both science and spirit and the ecology of the land. I wonder if you are over-interpreting the MODIS data a bit, especially when flagging concerns that draw on individual detections. Over on BigSurKate, one of the commenters — I think it was Regina — posted a link to sartopo.com. (For example: https://sartopo.com/map.html#ll=36.21034,-121.55718&z=12&b=t&a=fire,modis) This brings up a different sort of MODIS data visualization. If you zoom in close, it gives the temperature, emissivity, and confidence level for each detection. Lower values may be spotting or the very beginning of something worse, but they may be hot smoke or errors too. 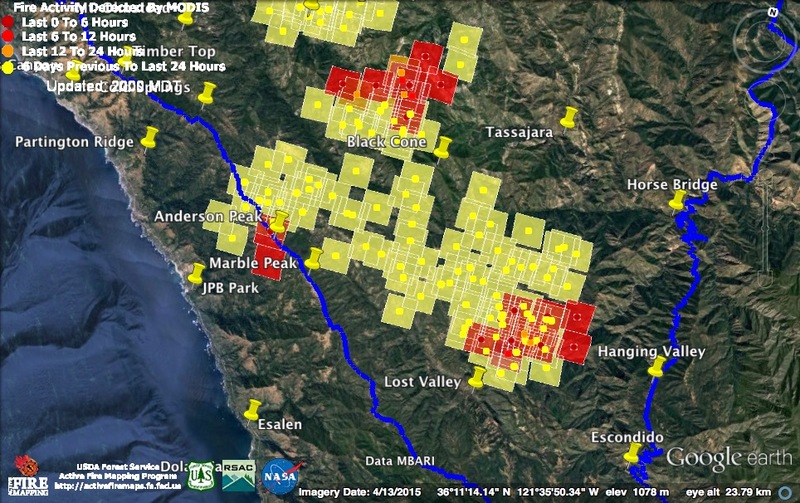 In this evening’s situation, the one detection by Lost Valley Camp and the one detection unequivocally over into Tassajara Creek drainage have confidences between 40% and 50%. Sort of iffy. 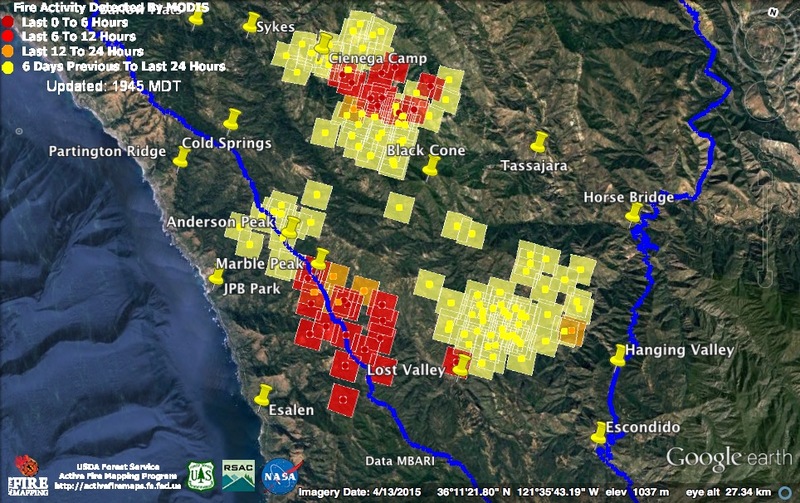 The concerns you about the fire running up to the Coast Range from Lost Valley or spreading into the Tassajara Creek drainage, the ones at the very end of the 7:45pm 9/12 post, are real … but they are better understood in the context of the high uncertainty behind the detections most supporting them. I’ve tried to be very clear about the limitations of MODIS data (see the “Important Caveats” at the top of the page) and I rarely make any definite statement about fire location based on MODIS data alone. 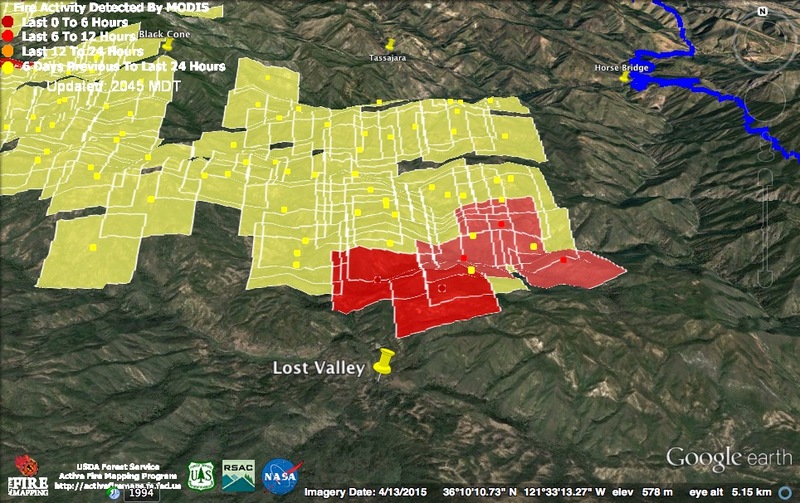 Instead, I try to reconcile what appears in the MODIS and IR data with reports from the Forest Service and others on the ground to build as complete and up-to-date as possible a picture of what is happening. If I have over-interpreted today’s data, I apologize. My statement in tonight’s report that the fire “appears likely” to have spotted over into the Tassajara watershed is based not just on the one heat detection unequivocally in the Tassajara watershed, but also on the size and intensity of the run, extremely low RH creating ideal conditions for spot fires, and the fact that previous runs in that area have resulted in fire spotting over (as reported by the Forest Service). My confidence in the single heat detection in Lost Valley is based on the fact that it falls exactly where I would have expected to see heat today based on the fire’s recent movement. Perhaps I should not have made my statement about it as definite as I did. I’m sure I wouldn’t have if it had involved a heat detection outside containment lines or anywhere else where exact location made a difference. Today’s MODIS data, for example, does not convince me that the fire has jumped the Coast Ridge line (even though at least one of the detections outside the line has a confidence level of better than 80%). This is because I have not heard any reports suggesting a breach of the line in this area. While it does not provide information on temperatures, etc. (which are, themselves, subject to a good deal of error), I prefer the MODIS data in these .kml files to more detailed formats because I think it provides, for most people, a clearer picture of the fire’s general location in relation to known landmarks. I also think a bunch of exact temperatures and confidence numbers create a false sense of accuracy and exactitude. All of those fires burning in the western United States at one time. My goodness that is a sad sight. My main point was to aim you to look at the MODIS temperature, emissivity, and confidence data if you were not doing so already. If you are folding that information (with it’s limitations too) into your thinking when drawing observations, great. I’ve also found it informative to compare the next day’s IR flight perimeter (yet another imperfect information source) against the previous days’ MODIS detections. It’s an interesting cross-check. For example, overlay this morning’s perimeter (http://ftp.nifc.gov/incident_specific_data/calif_s/CALFIRE/2016_Incidents/CA-BEU-003422_Soberanes/IR/20160913/20160913_c0415_Soberanes_Aircraft3.kmz) against the 9/12 MODIS rectangles. Those low-confidence detections do not seem to verify. I’ve seen enough of that over the weeks to reinforce, in a strong way, the limitations of MODIS you so clearly state up top in the blog. I didn’t take it as an attack. I think this is a good discussion. The more attention paid to the limitations of the various heat mapping technologies the better. While the IR scans are more sensitive than MODIS (finding heat that MODIS cannot and pinpointing its location more accurately), they are still an imperfect snap shot of a moment in time (and there is usually more recent MODIS data to be had). I think the most misleading aspect of the IR maps is the “fire perimeter,” which is just a line drawn around the actual heat detections. I have seen cases where entire neighborhoods that were successfully defended against a fire, nevertheless ended up inside the IR “fire perimeter” due to careless map making. That being said, when subsequent IR data disagrees with earlier MODIS data it is most often, but not always, the case that the MODIS data was erroneous. 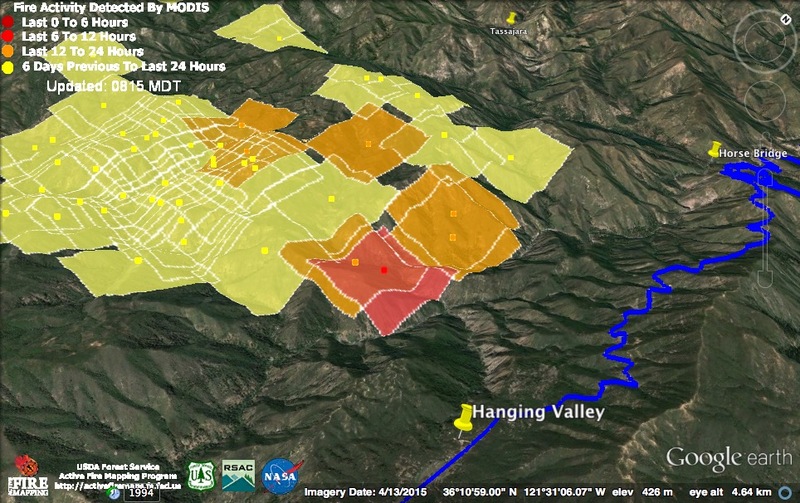 For me, the real value in these heat mapping technologies is not in their ability to determine whether a fire has crossed a particular ridge, stream or line (something that neither MODIS nor IR can reliably do), but in their ability to provide as up-to-date as possible a picture of how active the fire is and the general areas where it is most active. Most people visiting this site come looking for an answer to some variation on one of those questions. 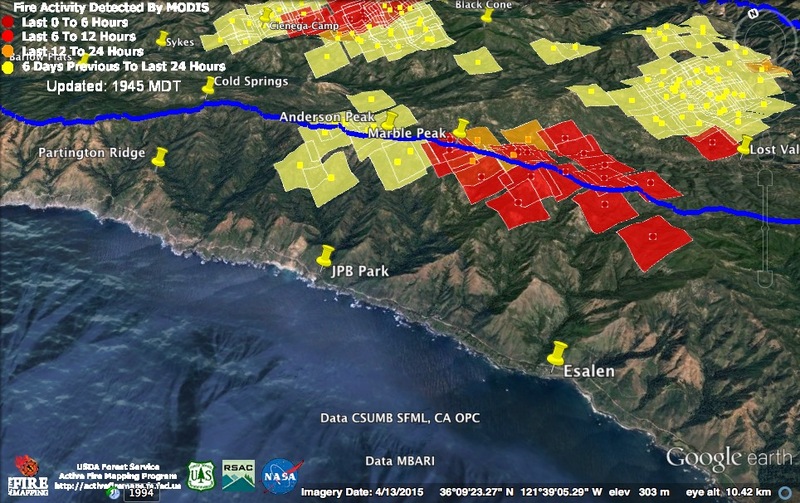 I primarily use the MODIS data, because it is usually the most current and it is easy to present it in a visual format that answers the question at a glance, while avoiding misleading features like precise fire perimeters. Hopefully, people are getting the message that outlying heat detections should always be treated with suspicion. Thanks for all you continue to do to monitor this fire, Keith. It’s the first thing we look at in the morning and the last thing we check before we go to bed. Don’t know where we’d be without you and Kate these past eight weeks. Deeply grateful. So I just now watched from my house, the arroyo seco area be lit on fire, I have watched this over and over again from where I live. I can see arroyo seco all the way to big sur. Now, there is no question this burn is being purposely set, my question is , why has the public not been informed? This has been a prescribed burn for a while now, I know because I have watched it and taken pictures. Does someone need to inform the news? Keith, thank you for all the information you and Kate provide for the many communities of the central coast. As others have mentioned, your two sites are usually the first and last sites I check each day. That said, go sailing and have a wonderful time on the water! Do people know about the public meeting tonight? Does anyone here follow Stan? https://blogbigsur.wordpress.com/2016/09/16/burnout-operations-for-the-next-two-weeks/. I’ll admit I’m favorable to Kate first, since she was kind enough to spread the word about my request to publicize the memorial of a beloved volunteer firefighter friend a few years ago. I never intended to slap anyone in the face, although I believe it’s helpful to see everyone’s perspectives, near and far. Throughout this recent fire, I’ve worried about other friends who may have lost their homes and were evacuated the first day, July 22, 2016. In defense of my comment re: “increasing suggestions”, (as Kate knows I’m a local news hound), they come directly from the MoCo Weekly and KSBW’s online comments – see particular K. Knoll’s comments to MoCo Weekly print date 8/25/2016. My prediction is this fire won’t be out until Halloween, once the Alaska team has gotten a decent handle on our local topography and weather. Best wishes to everyone and be safe! The Alaska team has been gone since last Monday and has been replaced by a California Inter-Agency team. They are proceeding with what looks to be a full “big box” burnout, increasing perimeter lines to 1/4-1 mile. Part of the goal of this plan is a big reduction of personnel afterwards as the fire makes its way toward rainy season. Chews Ridge is very smokey today from operations in Piney Creek and Hennickson; no doubt about it, these folks are not afraid to light things up. I was told that the Alaska Fire team left because they felt there was no more need for them to back burn anymore. The sky and mountain range was clear for 2 days. Now, why did they bring in another team to start fire again? I’m just dazed and confused as to why they want to keep setting this area on fire? Is this the new protocol whenever there is a wildfire? Oh, by the way, can you clarify where the actual soberanes fire is and how they are coming up with these bogus containment numbers? The purposely set fire jumped the road at Chews Ridge, oops?